A run that has it all. The centerpiece is a 3-mile tour of Arthur’s Seat, which is Edinburgh’s main mountain, located about 1 mile from the city center. It is located in Holyrood Park, which gives a feel of the famed Scottish Highlands, with its open spaces, parkland, crags, and water views. 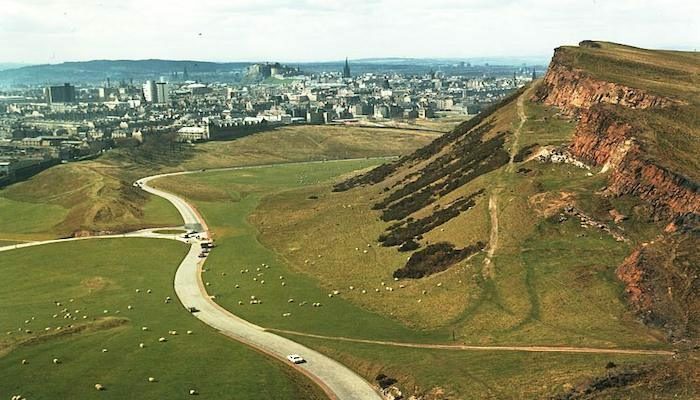 The most accessible way to run Arthur’s Seat is to do the loop around Queen’s Dr., a paved road encircling the park. it is not too traffic-y and there are decent shoulders. For a particular challenge, one can also take the trails paralleling the road or heading up the mountain. This is a hilly run, but gradual. At southern end of the park, near the roundabout at Duddingston Low Rd., take a 1 mile detour/add-on into the Innocent Railway Tunnel path and enjoy a cool & dark unique nearly 1 mile run through an old railway tunnel before popping back out under the Salisbury Crags. We’ve provided two options here: an out and back loop starting in the heart of Edinburgh Old Town. Run along the Royal Mile, which connects the castle and Holyrood Palace. Pass by the Toolbooth, the Cannongate Kirk (church), and then the Palace and modern Parliament building. At the roundabout, get onto Queen’s Drive, for the loop. For the short run, return the same way. For a longer run, after completing the circle, add an overlapping 0.5 miles on Queen’s Drive, return via The Meadows and the University of Edinburgh, using Bernard Terrace as the connector.